Kooikerhondjes belong to an old Dutch breed. 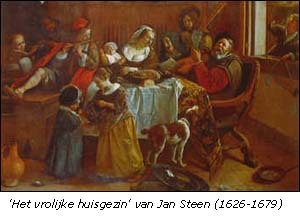 One can often find little dogs which resemble the current kooikerhondjes quite a lot, on paintings from masters from the 17th century, for example Jan Steen. But one can also find these dogs on paintings from the 18th and 19th century. We cannot only find the ancestors from our Kooikerhondje on paintings, but also in writings. Pieter Hooft, who is a historian, already told in his book ‘Dutch Histories’ about a little dog which saved the life of William of Orange in 1572, by scratching the canvas of his tent. William woke up in time and managed to escape the Spanish attackers. The history of the Kooikerhondje as a working dog in the duck decoy already dates from several centuries ago. In the beginning of the 20th century the Kooikerhondje seemed to disappear for a while, because the number of decoys declined. 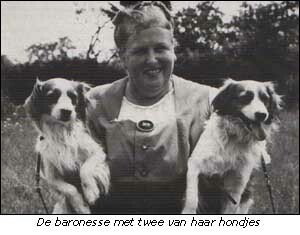 But Mrs. M.C.S baroness of Hardenbroek from Ammerstol made sure that the Kooikerhondje maintained and developed itself as a definitive breed. She gave a lock of hair and a picture of a Kooikerhondje to a pedlar, who managed to track down a couple of useful dogs in the country. 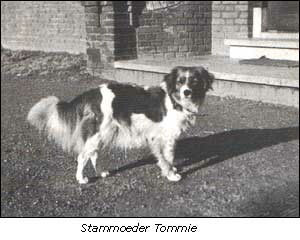 That is how she got female dog ‘Tommie’, from Friesland, which is generally considered as the ancestress of the current Kooikerhondje. The first litter was bred in 1942 and was named ‘van Walhalla’. Nico, a grandchild of Tommie’s granddaughter Carlienke van Walhalla, was the first Kooikerhondje to be admitted to the provisional register. The first recognition of the Kooikerhondje as a breed was given baroness by judging days, which were organised by the Dutch Kennelclub. These days were organised in 1958, 1959 and 1961. Provisional recognition was given on June 18 1966, and shortly after that it was possible for dog owners to include their Kooikerhondje in the provisional register. Several judging days were organised from 1967 to 1970 which were necessary for acceptance. The official recognition was given by the Dutch Kennelclub on December 20, 1971. At this point the current breedstandard became valid.